2 hour gastronomic walking tour through the architectural splendor of Dumbo, with all food included. Skip the line access and exclusive tour discounts at each location. With its spectacular waterfront access, thriving art scene and an architectural grandeur that's at once raw and charming, it's easy to see why DUMBO has become one of Brooklyn's most buzz-worthy neighborhoods. Less than two decades ago, the former manufacturing district (whose name stands for Down Under the Manhattan Bridge Overpass) was largely deserted, inhabited by a few artists who had colonized its lofts; today the area is awash with art studios, technology companies and luxury residences, as well as the kinds of amenities—stellar French bakery, edgy independent bookstore, designer boutiques—that typically follow, and this gentrification has also brought with it some gastronomic delights that serve as our map on this delicious dive into the Dumbo Food Tour of New York! • Food We can't reveal the exact tastings and the establishments until the day of the tour, but trust us, we've done our research to bring you an exquisite selection of mouth watering food! 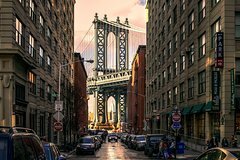 • Aside from the food, there is much more to experience on the tour, from street art to hipster watching, and the stunning view of the Manhattan and Brooklyn Bridges, there are many more hidden stories and secrets in store on this cultural dive into Dumbo.